Whether you are looking to buy or sell a house, town home, condo, land, farm, or commercial property in or around Accomack County, including Chincoteague Island, Chincoteague Bay Trails End, Captain's Cove, Assateague Island, Wallops Island, Wattsville, New Church, Oak Hall, Parksley, Corbin Hall, Olde Mill Point, Accomac, Onley, Onancock, or the surrounding areas then you have come to the right website. I can also assist you in Worcester and Northampton Counties. Here you will find a wide array of information about local real estate for sale. Please click the Property Search button to find your next dream home. I was born and raised on Chincoteague Island, Va. After venturing into the world for several years as a Federal Law Enforcement Officer, I returned to my hometown area to give back to the community I was raised in. I have been active in the New Church Vol. Fire & Rescue since 2005, and served on it's Board of Directors from 2007 to 2019. I have served at the rank of Captain, Deputy Chief, Fire Chief, Vice President, and Chaplin over that time. I received my Real Estate license in 2005 and my Broker's license in 2010. I am dedicated to assisting buyers and sellers in obtaining their specific goals. I have received the Salesperson of Year Award for my company on more than one occasion. From 2009 throught 2017, I served on the Eastern Shore Assoc. of Realtors - Board of Directors. In 2014, I was elected as an officer of the Directors and served as the Board President in 2016. This shows the respect and trust I have earned from by peers as well as my clients and customers. In 2015, I advanced my career to become partner in the Dockside Properties firm. And in 2017, based on the request of multiple clients, became a licensed Broker in the State of Maryland. By working with a local Realtor, like myself, you have the advantage of being able to access all local listings available through the Multiple Listing Service (MLS). Using a Realtor also gives you the comfort of knowing that you are working with the most qualified professional who is dedicated to you as the buyer or seller and will always be looking out for your best interests and striving to make the process of buying or selling real estate as comfortable and pleasant as possible. Please click the Contact Me button or give me a call at 757-894-1479 or at the office, toll free, at 888-939-SOLD. Also, if you have not already, visit the "My Account" section and sign up for instant updates on the properties that interest you the most. Find out about new listings fast and before the average home shopper. Thank you for visiting my website. I hope you find the information on this site helpful and informative. Published Articles by or about me!!! Dockside Properties has been a leader in sales for over a decade!! of all agents who are involved in the ESAR MLS! Call me today to find out why!!! Chincoteague Island is named the 2nd coolest town in America!!! Chincoteague Island Ranks #2 in US island destination. 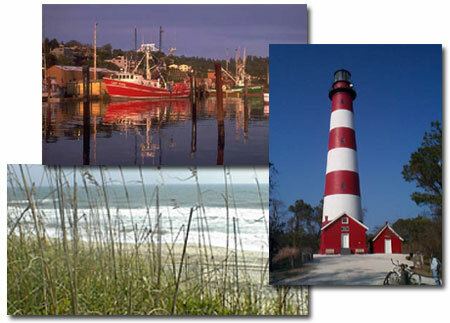 CHINCOTEAGUE ISLAND NAMED #1 BEACH TOWN IN USA BY AOL TRAVEL - SUMMER 2010!! North America's Most Charming Fall Islands-Chincoteague makes the list! Travel & Leisure Ranks Assateague Island in TOP WORLDWIDE BEACHES!!! Weather Channel visits Wallops Island, Va.
Trip Advisor also names Island Creamery on Chincoteague Island as BEST Ice Cream!!! Commonwealth of Virginia and the State of Maryland.